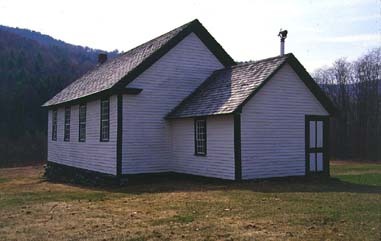 The rectangular, one story wood schoolhouse was built in 1844. The building is a vernacular structure with little architectural detailing. The foundation is made out of stone, and the gable roof is covered with wood shingles. The exterior walls are covered with wood clapboard and the roof has wooden shingles. A small square shaped addition was placed on the gable end elevation (main facade.) The vestibule is smaller both in width and height as compared with the main structure and is placed flushed with the wall on the right side of the building. The vestibule date is not known. The cornice on the main building has carved return ends, but in the addition the details are far simpler. On the front wall of the foyer, a small four-paneled door is placed towards the left side. The foyer area has one nine-over-six window on each side. The main block has four evenly spaced, twelve over twelve windows at each side. All of the windows have simple and narrow wood surrounds and are placed just below the roofline. The back and front elevation have no windows. On the back elevation there are two wooden doors with simple wood moldings around them. On the roof, towards the end of the building, is a small brick chimney just slightly off center.